Reedy also researched pig noses and ears in Google Images to produce a number of sketches for Sugar Mountain, the company that launched the truck in June of 2009. From design to finish, it took about three months to build the solid-looking giant iron pig, which is made of fiberglass. Its rusty appearance is so realistic that people were asking when it was going to be painted when it first took on the road, said Reedy. Sketched Sept. 15, 12:38 p.m. I don’t feel as comfortable judging the truck’s culinary offerings as I do about qualifying its design. 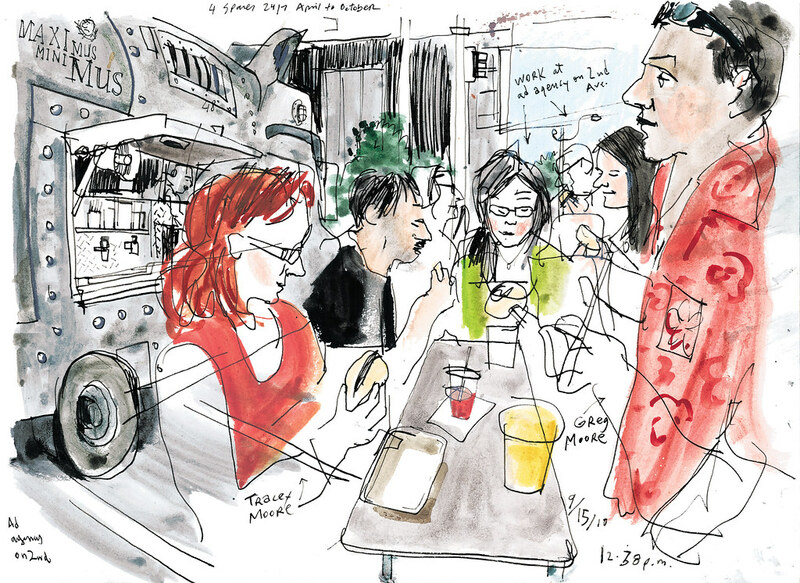 Like Reedy, I can also sketch a pig truck, but I’m no expert when it comes to food criticism. That being said, my pulled-pork sandwich –I chose the sweet sauce– was delicious. And the lively scene around the rolling kitchen just added to a great lunchtime experience. I felt like being in a small village as I mingled with the lunch crowd gathering around outdoor tables. Next to me were Tracey and Greg Moore. Greg, a local carpenter who is originally from Texas, complimented both the barbecue and the truck design. “This is scenery on wheels … very nice.” He had been wanting to see it since spotting it on the freeway one day. To find out what it was, he googled “big steel pig truck,” and Maximus showed up right away. An all-girl party of office co-workers from a nearby agency joined the table later. They also raved about the sandwiches and the fun atmosphere. It was their first time coming here on their lunch break. 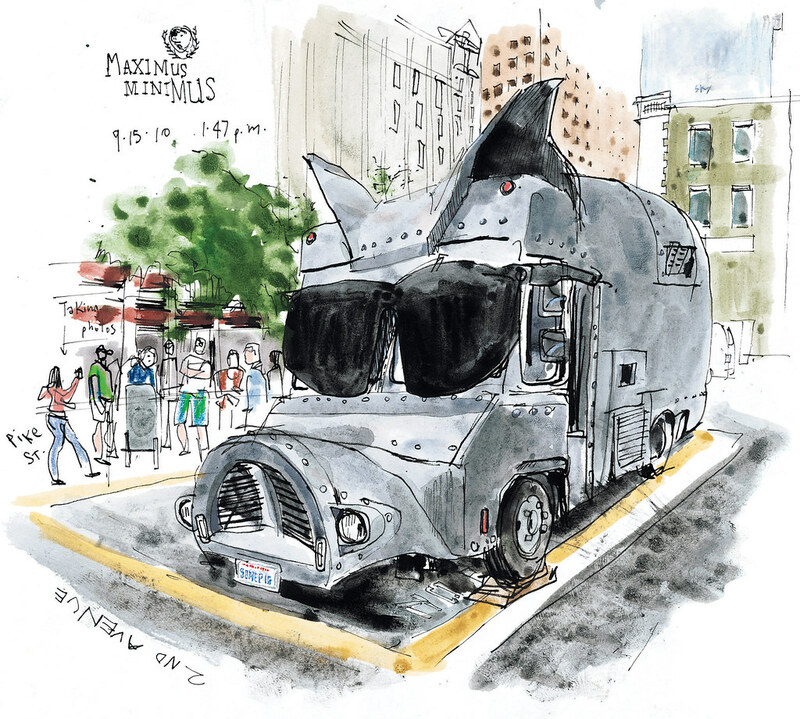 Unlike other Seattle food trucks, Maximus only operates in the summer months. General manager Lance Marlow said they will be open through the end of September and come back in April.